Why did Stellar Give Away Free Lumens? By the second week of November, Stellar Development Foundation and Blockchain Wallet partnered for the so-called “Largest Ever Airdrop of Coins”. It was a massive initiative of distributing US $125 million worth of XLM, Stellar Lumen, the cryptocurrency based on Stellar Blockchain. Each user signing up for the Blockchain wallet for the first time will receive US $25 worth Stellar Lumens. Although this is a small amount, this is adequate to start with Stellar Blockchain Solutions development. Jack McCaleb, co-founder of Stellar, believes such “airdrops are central to creating a more inclusive digital economy.” He clarified Stellar is giving free Lumens, despite its high market value as an invitation to communities to design the services they need. This airdrop is imperative to pace up Stellar Blockchain Solutions. However, will it impact Stellar price? What will the impact of such free distributions on investors in Lumen? Currently, Stellar price is around US $0.199, which is low compared to many other crypto coins. However, after a week of the latest airdrop, Stellar entered the league of top fives. Lumen’s popularity also crashed Bitcoins Cash making to head down below the top fives. Additionally, Stellar debuted in the middle east market in the middle of this year in July. The company is working on a strong strategy to become a cryptocurrency giant. Furthermore, the Stellar Blockchain Solutions as payment technologies are becoming a preferred choice for many large and mid-level enterprise. Against this backdrop, airdropping the coin will increase its market cap significantly. With increasing market cap, Stellar price will gradually rise, offering better incentives to investors. Cryptocurrency investors are well acquainted with the market rivalry between Ripple’s XRP and Stellar. While Ripple is expanding its market, by this airdrop, Stellar, in fact, is partnering with Blockchain creating a market ecosystem. Clearly, Stellar wants Blockchain to become the universal system in cryptocurrency landscape. The company wants to gain mainstream adoption and drive both its new and old users. Peter Smith, CEO of Blockchain says “free tokens is a great way to boost” mass adoption. 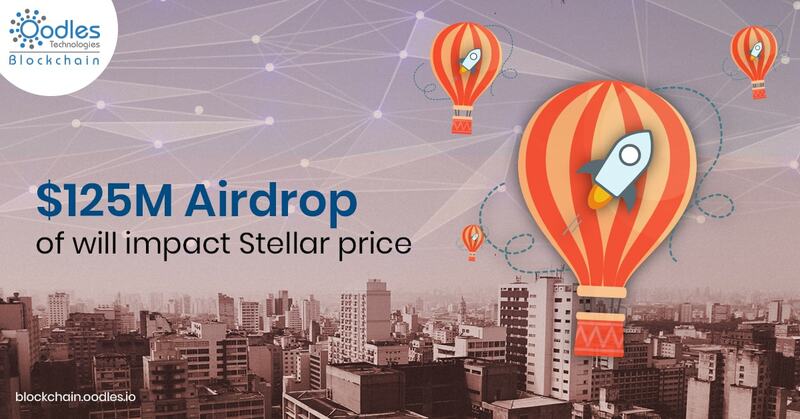 He is also focussing on the airdrop strategy to let global users know Steller’s strong features like low-cost, instantaneous and scalability in use cases. Stellar is an open source and decentralized platform and it gains an edge over similar other systems like the Ripple due to these facets. As a payment mechanism, it is an efficient micropayment system for cross-platform transactions. Any pair of currencies can be swapped over the blockchain. Stellar has a strong perspective of becoming a universal payment blockchain for transferring cross-asset values. A popularity of this platform will put a thrust on Stellar Blockchain solutions. The recent airdrop will distribute XLM to 5 million more users. The market of the coin will increase by this number. A good portion of this new users is expected to use the currency to develop Stellar blockchain as payment solutions. Thus, apart from increasing transaction of the currency, the technology will also gain significant popularity.